During last year’s presentation at The Game Awards, a very brief teaser was shown off for a new title developed by From Software. Fans immediately being their usual cycle of wild speculation, ranging from everything from a new Bloodborne (Shadows Die Twice, after all) to resurrecting Kuon, a Kaidan-based survival horror game from the PlayStation 2. Not many people would realize that From Software was actually teasing a new IP: Sekiro: Shadows Die Twice. First shown off during Microsoft’s EA conference on Sunday, From Software is returning to the roots of Japanese folklore with a new IP, surprisingly published by Activision. 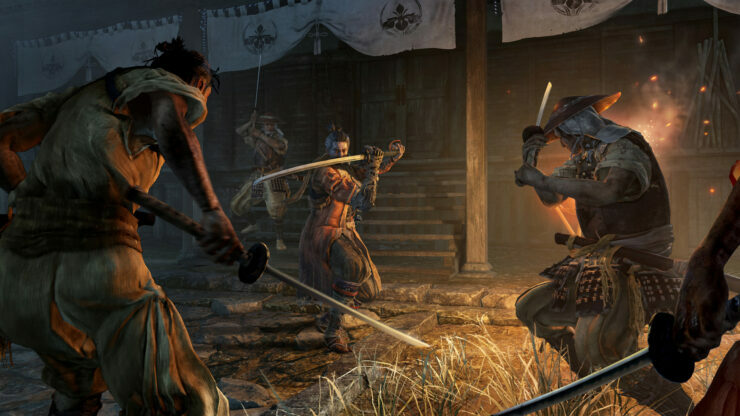 Sekiro: Shadows Die Twice is From Software finally escaping from the clutches of Western civilization with a trip halfway across the world, to a new setting in Sengoku-era Japan. As Kitao-san explained during our presentation, Sekiro is “certainly not a history game, per say. (We) created an original world based on that time period. One of the concepts of this game is this mix of violent, bloody world of civil war with the beauty of the nature of Japan. That said, this is a From Software game and it’s an extremely dark world”. When players get to some of Sekiro’s larger than life bosses, such as the wandering monk that’s reminiscent of Kurosawa samurai films with a fight upon an old lacquered wooden bridge with falling Japanese maple leaves to set the thematic tone. Only a few characters were shown during our private presentation of Sekiro: Shadows Die Twice. At the center of the story is a young lord with something special about him which makes him an easy target. The main character of Sekiro is a shinobi that serves the young lord (who they aren’t quite ready to reveal his name yet). In trying to protect his ward, the main character has the young lord kidnapped from him, and in the process, has his left arm cut off by one of Sekiro’s main antagonists, ‘The Rival’. The desire to rescue his lord and get revenge for losing an arm are two of the main driving forces behind the beginning act of Sekiro: Shadows Die Twice. The guided demo for Sekiro: Shadows Die Twice opened with the main character seeing a giant castle way off in the distance where The Rival and the young lord are hiding away. When I asked Kitao-san about the level design and how the world came together, he likened the world of Sekiro to that of the first Dark Souls, which still holds a special place in my heart for how interwoven the world is and being able to see parts of the world at a distance that you can slowly make your way to. Perhaps ‘slowly’ making your way somewhere isn’t what Sekiro: Shadows Die Twice is all about. With a grappling hook built into the main character’s shinobi prosthetic left arm, there’s a lot of new options for mobility that haven’t been a part of From Software’s stoic adventures before. 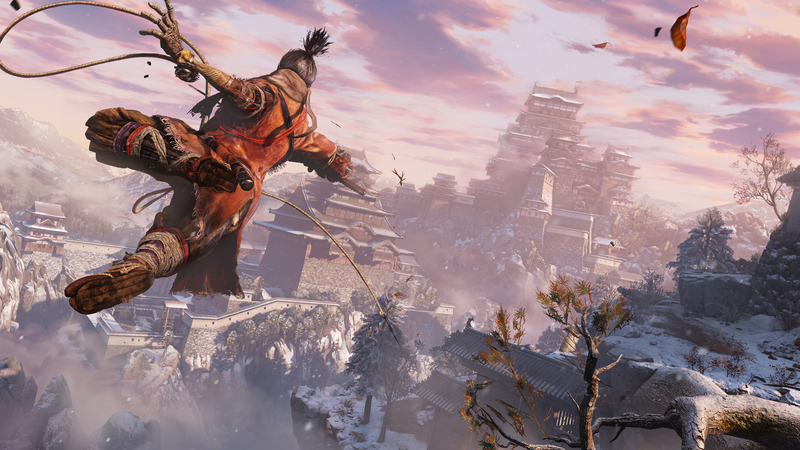 Sekiro brings actual jumping and climbing into the genre in ways that haven’t been explored in the genre. Traversing tall buildings or flinging through trees operates with the greatest of ease with the tool at hand and I got to see quite a large number of ways to use that extra momentum. Getting the drop on an unsuspecting enemy and dropping your katana through the base of their neck can be oh so satisfying. Given that the main character of Sekiro is a shinobi, the use of stealth should be expected even in an action game of this caliber. Learning which enemies react moreso to noise versus sight is important, as well as knowing which enemies to dispatch of first. Flintlock snipers can spot the player from far away and the loud crack of a gunpowder rifle can alert a wide range of enemies to you. The same could be said for a seemingly meek oba-chan that slowly patrols the first building our demo player entered, forcing him to enter a stealth mode and press up against a wall before she passed through and assassinate her before the worst could happen. I fear getting swarmed by enemies you accidentally brought attention to could be a common theme in Sekiro and the cause of many a death. In the few brief sequences of combat, many similarities could be drawn to the PlayStation 4 exclusive, Bloodborne. The main character was equipped with a katana in his right hand that did double duty between offensive strikes and both blocking and parrying incoming attacks. Kitao-san mentioned that posture was an important aspect to the combat, with running out of this invisible stat can leave both you and the enemy vulnerable to critical hits. Whether this replaces what Souls players are familiar with as poise leaves much to be answered, especially if there are multiple armor sets and weapons that have their own effect on posture. The shinobi prosthetic had a number of different attachments (ala Hunter’s Tools) to interject between melee attacks, such as a fireball ninpo and fire enchantment for the hero’s katana, healing ninpo that presumably act the same as an estus flask, and in the trailer (but not the guided demo), an attachment that could summon a metallic shield to block heavier attacks. Since the UI was disabled for this demo, we couldn’t get a glimpse at how these tools were equipped and used by the player, whether they were consumable items to get replenished at a nearby bonfire or reusable gifts that consume magical power or whatever other form of energy the hero has. 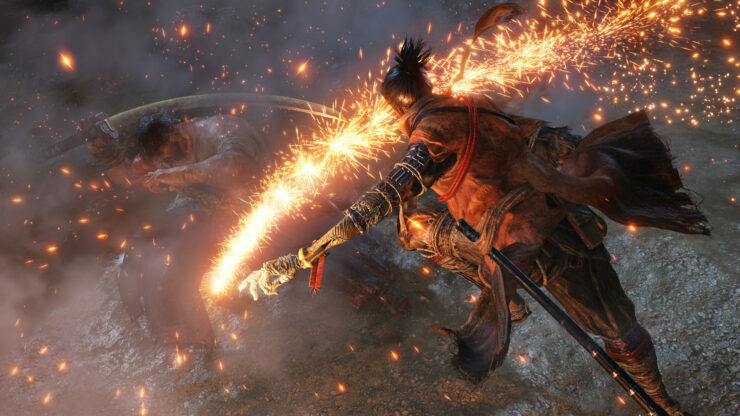 The subtitle for Sekiro, Shadows Die Twice, is a mechanic that players should appreciate in the wake of the Souls formula that players have grown to have a love-hate relationship with. In fights, dying does not signify the end of a challenge and a return to the kindling bonfire that one might expect. Instead, players are given the chance to resurrect themselves mid-combat to resume the fight with renewed strength and a second chance. The verdict is still out on some of the more mechanical aspects of dying. Does it refresh your ninpo and consumables? Are you brought back to 100% health and stamina? What resets your death counter? I heard the telltale twinkling sound of a bonfire during the demo resurrection, which leads me to believe the Souls basis is closer than one might think. Until I get my hands on Sekiro: Shadows Die Twice for myself, there will still be plenty of mysteries to solve. In a sharp contrast to every Souls-like game that From Software has developed, Sekiro: Shadows Die Twice is purely a single player experience. This means no server connectivity, no orange soapstone messages, no bloodstains that might give away the element of surprise. Through development, they had to make the tough decision of how going multiplayer or only single player would affect game design. As Kitao-san mentioned at the end of our demo, if (we) go single player only, (we) can go very deep with a single type of character and they wanted to see how far they could take it. The gaming market always has room for another unique From Software RPG and what better way to celebrate a new take on the Souls genre than with a new title from Miyazaki-san himself. The faster combat (swordplay looks even more fluid than Bloodborne) will surely lend itself to some intense duels between honorable men on the battlefield and should be a welcome change to my typical spear-and-shield approach of a Souls game. 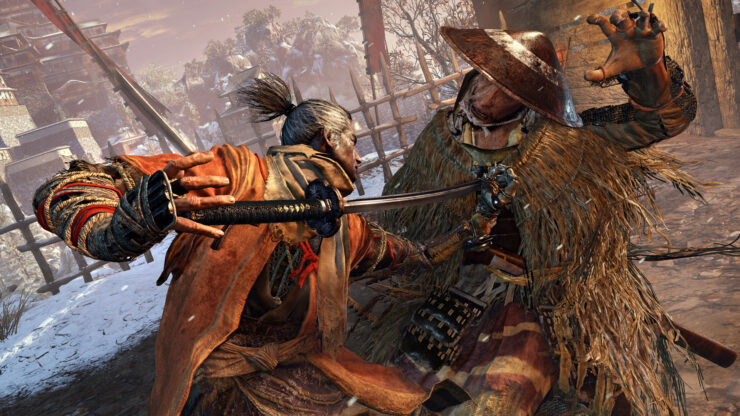 If there’s but one negative to end talking about Sekiro: Shadows Die Twice, it’s that 2019 can’t come fast enough!